Every year, I blog on my birthday. This is my 10th birthday blog, and I’m proud of that. I did, as I do every year, look back and read through some of my previous blogs. I realized – I am a busy person! I do a lot in a year. I got a new (yes my second) tattoo. This one is about peace. 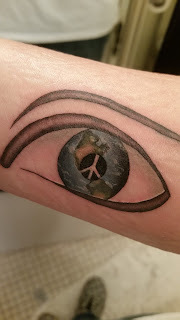 There is a peace sign in the middle of a world, which is the iris for an eye. The idea is what we see – what we deliberately see – we create. If we can see peace, we can be peace. In this time of world unrest, and USA unrest, this message is very important. I’m proud to wear it on my arm so I am reminded every day. It also matches the same place on my right arm as the love tattoo of last year sits on my left. So I’ve got my love and my peace. I’m ready for my flower garland – hahaha! I finished the exam and started the thesis for my Master’s degree in Metaphysical Science. I expect to finish the thesis by end of January. And more. That’s just off the top of my head. It’s hard to discern. I would say that overall, I realized how to stop worrying, how to incorporate an awesome manifesting technique into my day (which works! ), how to trust the universe more, and be awake, and stepping more fully into my role as a spiritual being ready to share what I know with others. My birthday today was pretty uneventful. And that was a little disappointing. I did my normal Tuesday thing. I saw 4 hospice patients, took myself out to lunch (a nice lunch – it was my birthday after all), and spent the afternoon shlepping kids around. Tonight I went to watch Eli perform with his Rock Band class, and he did a great job. I did get over 200 birthday wishes on Facebook and a nice call from my parents. It’s fine.